Persistence is exactly what 60 University of Michigan students are practicing after an unexpected turn of events at SpaceX's 2018 Hyperloop Pod Competition. Michigan Hyperloop, one of 20 participating teams in the competition, never made it to race day, but members learned a lot from industry professionals and the winning team, WARR Hyperloop, from Munich, Germany. Despite a short-term setback, they are already making plans to enter the next competition. For the past four months, we followed Michigan Hyperloop's progress leading up to the competition. This week, we touched base with Stephanie Shantz, a Michigan Hyperloop team member, after race week for a recap. This is what we learned. When Michigan Hyperloop's race team arrived at the SpaceX campus on July 16, members submitted the 191-page final design package and presented their pod design to the SpaceX team. Filled with nerves and excitement, team members were anxious to receive feedback. "They looked really in-depth at our design and noticed things that could become potential problems," Stephanie says. The redesign required multiple trips to a nearby warehouse for parts and countless hours of work during the first part of the week. Together, the team successfully changed control systems. On Wednesday, as the team was going through checkpoints on their design, another team put their pod in the vacuum chamber for a test. That team's motor controllers, the same ones used in Michigan Hyperloop's design, arced in the chamber and welded the contactors shut despite the manufacturer's assurance. "The supplier told us they were vacuum compatible, and they obviously were not," she says. Due to that incident and safety concerns, Michigan Hyperloop decided not to test their pod in the chamber or participate in the final race Sunday. Despite not planning to participate in the competition, the team continued working on the pod and completing valuable tests through Saturday. "As a team, we still had a good showing," she says. "We got to see our system come to life." The team also enjoyed meeting other participants. “They were all so welcoming, and it was awesome to meet such a huge group of people that share the same passions as we do,” she says. 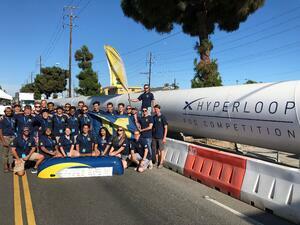 By race day, July 22, Michigan Hyperloop had 20-25 people on SpaceX's campus. The team displayed its pod design for attendees and explained the different elements of the design. One part that set Michigan Hyperloop apart from many of its competitors was the unique braking system. "The W.C. Branham caliper brakes seemed to really catch people's attention," Stephanie says. "Every team was very surprised we did not do braking on the I-beam, as that is very common. They were impressed by the uniqueness of the rotor/caliper braking and really liked the failsafe nature of the brakes. All in all, the braking system was the most sound of the systems on the pod." Troy Branham, president of W.C. Branham, was unable to attend the competition but waited anxiously for news about race day. "I kept refreshing my twitter feed throughout the day on Sunday, eager to hear about the race results and how Michigan Hyperloop's pod performed," he says. "When I saw that they were not one of the three finalists that SpaceX selected, I felt for them because I knew all the hard work, over the course of 10 months, that they put into this project. The engineering was nothing short of amazing. It wasn't a soap box derby that they entered." Following race day, Stephanie broke the news to Troy, explaining why the team chose not to race. "Despite not running on race day, she remained upbeat and was proud of the UM team's effort," he says. "I was pleased to hear about how their approach to the braking system received very positive feedback from other race teams and SpaceX. One reservation we had was braking on the I-beam, so when we learned that Stephanie and her braking team had something else in mind, we were all in." It was an intense and busy week at SpaceX, but one that taught Michigan Hyperloop a lot about their project and ways to improve next time. That's right! SpaceX announced another Hyperloop Pod competition next year, and after a week off, Michigan Hyperloop is already discussing ideas for the coming year. "Walking away from a week of getting grilled from SpaceX advisors — hearing their opinion and asking questions — will help us leaps and bounds this coming year," Stephanie says. The team is uncertain if they'll use a similar design to the pod they created this year, but they'll use what they learned from SpaceX advisors and fellow competitors' designs to improve. "We have a lot bigger list to look for in terms of potential problems to identify," she says. "That will be really helpful." WARR Hyperloop, for example, used eight wheels, each with its own motor to propel the pod forward. This prevented wheel slip, a common issue with many of the other designs. "The biggest takeaway from WARR is that they thought outside the box, and it was obviously very successful," she says. "It will help us challenge ourselves. I think it will inspire a lot more creativity from the teams." Although the trip didn't turn out quite like the team hoped, they are optimistic and enthusiastic for what's to come. "I'm really proud of the team because the resiliency I saw from them in just this week alone was really impressive," Stephanie says. Troy shared similar feelings about the experience. "We were proud to be associated with Michigan Hyperloop," he says. "We wouldn't think twice about working with them on Competition 4, should we get the call. These young adults are passionate and professional." To keep up with Michigan Hyperloop's future activity, click here.